Christoph Rosenberg has a post up on the RGE Europe EconMonitor where he argues he thinks a soft landing for Estonia is both possible and likely, always given, as he says, that the right policy options are adopted. In fact Christoph is reporting on an academics and policy makers seminar on Baltic Convergence recently held in Brussels. The seminar was jointly organized by the IMF and Eesti Pank, and both he and his fellow blogger Karsten Staehr attended. The gist of the argument presented by the participants was with the right policy mix a hard landing can be avoided in the Baltics. I have serious doubts about this, and in particular due to the relative time scales of the remedies being proposed and the rate at which the slowdown is taking place. That is, most of the remedies being offered appear to be longer term in their horizon of operation, whilst the crunch is actually coming in the Baltics over the next six months or so, ie in the comparatively short term. What I feel for the "soft landing" argument to be more convincing is that we would need to be seeing more evidence for it in the data. 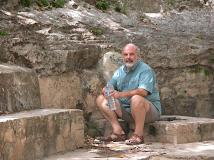 But if we look at what we have, we can see that the deterioration is continuing, and at a pretty rapid pace. Noone seems to be addressing head-on the central issue which would seem to be whether or not what we had in the Baltics was a demand bubble inspired by the designation of certain categories of property lending as worthy of investment grade, and a low interest inward flow of funds and loans in non-local currencies which appeared to be underpinned and guaranteed by the condition (ie not the option) of euro membership for all the new EU10 accession countries. What noone seems to have thought about was the impact on the macro economic dynamics in the short run of a rapid transition from win-win to loose-loose as the door has been steadily closed in the applicants face. Slovenia seems to have been the last one in before the door was temporarily closed, with Slovakia poised perilously like a man on a ledge half way up a cliff face, not knowing whether to continue climbing tenaciously upwards (or to jump now before he gets any higher), even as the ever stronger inflation-driven-gusts of wind and rain make his footing weaker and more tenuous with every passing step. And if the whole thing was a bubble, what can we ultimately expect from the reversal of fortune, and the schocking grip of debt deflation? Obviously any such thing seems a long way away at the present moment, as what we are faced with is an exceedingly hard to eradicate bout of inflation. Just how serious this position is in the face of the continuing slowdown is brought home by the last set of inflation figures, and todays announcement from the statistics office that wages actually rose in Q4 2007 at a year on year rate of 20.1%. 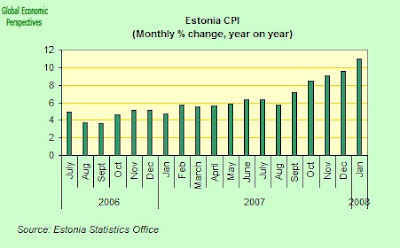 Estonia's inflation rate rose to almost a 10-year high of 11 % in January (see chart below) following a 9.6% annual rate in December. So while domestic demand is rapidly slowing, inflation is still accelerating. This process will not, of course, continue indefinitely, and at some point we will see the reverse face of this, as price deflation gets its grip when demand falls below capacity, as it obviously is going to do. We have two lines moving in opposite directions and at some point they will cross. What we can say is that given the major suplly side capacity constraint has been labour, it should not surprise us if we find the phenomenon of extremely "sticky wages" in the Baltic context. 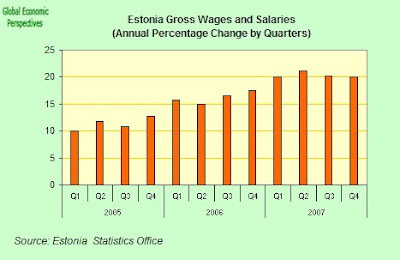 And so, it is, indeed, wage growth in Estonia, as I have said above, remained virtually unchanged in the fourth quarter from the previous one. The average monthly gross salary rose 20.1 percent from a year earlier to 12,270 krooni ($1,161), compared with an increase of 20.2 percent in the third quarter, accdoring to the statistics office in Tallinn earlier today. Wages have risen due to labor shortages as Estonia's ageing population and an outflow of workers to wealthier countries have steadily pushed unemployment to a 15-year low of 4.1 percent in the fourth quarter. The impact of these ongoing increses in wages can be seen in the continuing high inflation in producer prices , and even more importantly in the continuing increase in export prices. 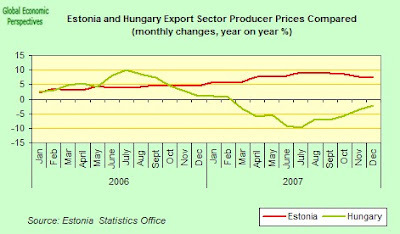 Since domestic demand (ex government spending, and EU fund transfers) may well start to contract at some point, exports are the only real hope for the Estonian economy in sustaining GDP growth in positive territory, but just how far Estonia has to go in putting things into line to do this can be seen from the comparison between export producer prices in Hungary and Estonia shown in the chart below. Export prices have been falling in Hungary for nearly a year now, and as a result Hungary now has a small goods trade surplus. Estonia has still to really start this process. And remember, with each month that passes and producer prices continue to rise (ie the PPI index remains above zero price growth), the more pressure there is on the competitivity of Estonian exports and logically the more pressure there is on the kroon peg. Enough said, I think. 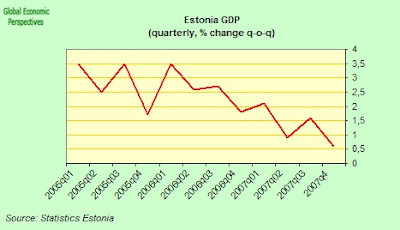 Estonian economic growth more than halved last year reaching a year on year rate of 4.5 percent in the 4th quarter (according to preliminary data), and this was an eight-year low, in the fourth quarter. A rapid decline in the rate of wage growth is crucial if Estonia is to avoid a sharp slowdown as even central bank Vice Governor Marten Ross admitted earlier this week. If we look at the quarter on quarter growth rate chart, the dramatic nature of the decline is evident. As I keep saying, I don't know what sort of charts the people who argue the soft landing view are accustomed to looking at, but I humbly suggest that the sloe is a lot softer than the one we are looking at here. 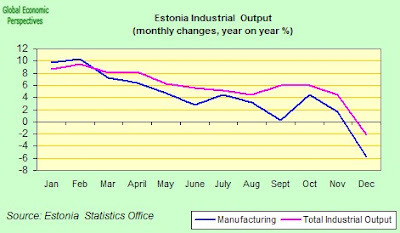 And the fact that year on year Estonia is still growing at 4.5% is hardly reassuring, since we are only in the early throes of the slowdown at this point, and there is no sign in the line of any significant slackening of pace. When we get to see some "bottoming" then we will be able to make some initial damage assessment, but the airplane is still loosing height, and fast, at the moment. More evidence of the way things are slowing down comes from industrial output data. 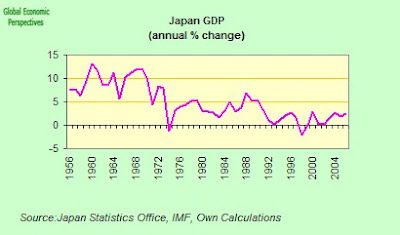 Output is in free fall downwards (see chart below, as are retail sales which is showed in a chart above), until we can see some sign that this rapid rate of deterioration is slowing it is far too premature for people to start arguing they have evidence of a soft slowdown (rather than expressing their hope that his will be the case, but here as ever, hope is one thing, and evidence to justify the hope quite another). The important point to grasp here is that this is now all about timing, the whole drama looks likely to be played out over the coming six months, and unfortunately many of the remedies being advocated by Brussels and the IMF, including facilitating the switch of production and investment from non-tradable sectors to tradable sectors, and the strengthening financial supervision are longer term measures. And in any event are so obviously commendable (I mean, who at the end of the day would disagree that the violent husband SHOUL stop beating his wife) that they risk being platitudes: the question is the how. And one of the recommendations, that "wages should be flexible and remain in line with companies’ competitiveness and productivity conditions, just went out of the window, at least as far as this downturn is concerned". Which leaves us with the fourth recommendation, that "fiscal policy should not seek to offset a contraction in demand, even if the Baltic economies enter a period of slow growth". Being very contrarian, even here I have my doubts. We need to take into account that the recommendation to increase the fiscal surplus was issued in one situation, and we are now very rapidly entering another one. Before the problem was excess demand, and now the problem is going to be lack of it (again in the short term). Unless the Estonian authorities plan to do something more radical than I am contemplating they will do in the short term about the peg, Estonia will effectively be without conventional monetary policy tools in this situation (as it was in the situation which lead up to it). To deny the Baltic economies fiscal alternatives given the gravity of the sitiuation they face would, to my mind, be unduly conservative. Demand management is about just that, slackening demand when there is too much of it, and increasing demand when there is insufficient. So for exactly the same reasons the IMF were argeuing for fiscal tightening one year ago (that there was no effective monetary policy tool available) I would suggest we could consider the opposite policy now, especially since the global credit crunch is now steadily tightening its vice across Eastern Europe. Basically if it makes sense to brake at the end of the straight as you enter the curve, it also makes sense to accelerate and not hit the brake even harder as you go round it. You don't have to be Fernando Alonso to know that. And of course we are only talking about short term stimulus here, not long term structural policies, but since the Baltic economies - unlikely Hungary and Portugal, have comparatively low levels of debt to GDP, then they could well permit themselves this option I feel (according to Eurostat data, accumulated government debt as a % of GDP - ie not the annual deficit, the entire sovereign debt - for Estonia in 2006 was only 4.1% of GDP, for Latvia it was 10% and for Lithuania it was 18.2%, ie this is a pittance, and there is leeway for demand management cushioning, which is why I did not look so negatively on the proposal from the Latvian government to change tack at this point, of course they should have been braking hard six months to a year back, but we are now past that point, and it really isn't useful at this stage to be simply crying over spilt milk. There will be plenty of time for post-mortem's later). What this argument tends to forget, however, is that these banks themselves are not charitable institutions, but have their own balance sheets and credit ratings to think about. This point was brought home ealrier this week by Moody's Investors Service that it is cutting its ratings for Estonian banks on concerns of weakening asset quality due to high exposure to the cooling property market. Moody's assigned a negative outlook to Estonian banks, including AS Sampo Pank, fully owned by Danske Bank A/S, and Balti Investeeringute Grupi Pank AS. Virginie Merlin, senior analyst with Moody's in London and author of the report, is quoted as saying that the move ``naturally'' follows the decision on Jan. 18 to lower the outlook of AS Hansapank, the top Baltic lender and a fully owned unit of Swedbank AB, to ``negative'' from ``stable.'' Hansapank accounts for more than half of Estonia's banking industry assets. According to the report "Moody's primary concern is that the rapid loan growth has led to unseasoned portfolios with high concentration on the mortgage and real estate sectors....We therefore see a growing risk of a deterioration in the banks' asset quality if the economic outlook continues to soften"
And I think this is hardly unsurprising news, these banks cannot simply sit bank and watch their credit rating and asset quality deteriorate simply because it would be the "politically correct" thing to do. The Czech Republic, A Classic Case Of Bad Timing? The Czech Republic's economy unexpectedly expanded accelerated in the last quarter of 2007, graowing at the fastest pace in two years, fueled by investment, solid exports and rising employment. Gross domestic product grew at a 7.0 percent annual rate on a seasonally and working day adjusted basis (preliminary data), compared with a revised 6.4 percent in the third quarter, the Czech Statistical Office said today. The Office also announced that the economy grew 6.6 percent in 2007. The quarterly rate of expansion accelerated from the 1.4% achieved in the third quarter to a full 1.9% in Q4.However it should be noted that the statistics office single out expenditure by health insurance companies, which are classified as part of the general government sector, as contributing to the GDP increase by approximately 0.5 percentage points (ie a good part, if not all, of the acceleration). They suggest that this is probably due to higher demand for health services which remained free till the end of the year and in anticipation of the introduction of medical fees for certain services in 2008. So much of this may well be "one off". Following the news the koruna had its biggest weekly gain in 5 1/2 years - rising for a fourth succesive week - and at one point was up by as much as 0.7 percent on the day (at 25.080, its highest level ever against the euro), before closing at 25.193 by 4 p.m. in Prague. In the last week it has advanced by 2.4 percent, the fastest rate since June 2002. So far this year the koruna has been the best-performing of the nine European emerging-market currencies, gaining 5.5 percent against the euro. Household consumption has bolstered the Czech economy's expansion for almost two years now, and is driven by accelerating wage growth, a 30% y-o-y rate of increase in lending and a decade-low jobless rate. The very low number of people now remaining unemployed has given rise to concerns that if the economy should continue to grow as quickly as it is doing currently, then wage-cost driven inflation may get the economy in its grip in the way it has done in other EU10 economies. The average nominal hourly wage in industry rose by 11.3% in December 2007 over December 2006, while the average monthly nominal wage in industry rose by 7.4% in 2007 when compared with 2006. The extra growth is certainly creating employment, and there were 1.9 percent more people working in the economy during the last quarter of 2007 than there were one year earlier. Still, the statistics office (although it gave no details, for thpse we will have to wait till March) stated that household spending growth slowed in the fourth quarter (retail sales, for which we do now have December figures, rose only at an annual rate of 4.3%), dropping back from the 5.6 percent rate of increase of the previous three months, discouraged perhaps by the 4.4 percent inflation rate experienced over the period. 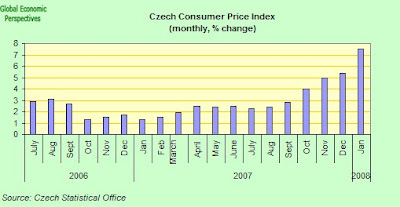 This change in the structure of Czech GDP growth, with consumer demand accounting for a smaller portion of expansion, and exports and capital investment accounting for more, is fueling central bank optimism that the inflation rate can gradually be clawed back to the mid-point 3 percent target by next year, from the whopping 7.5 percent registered in January. The bank predicts GDP will grow 4.1 percent this year after an estimated 6.1 percent in 2007, thus being a touch more skeptical than the Finance Ministry who are currently advancing a 4.7 percent growth outlook for this year. 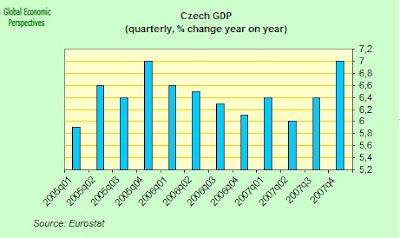 There is however still plenty of room for concern about the medium term evolution of the Czech economy. Only last week the European Union reiterated its call for the Czech government to address underlying fiscal pressures linked to the pace of population ageing in the Republic, and stressed that the administration needed to do more to prevent the creation of excessive budget surpluses. The call was made as part of the EU Commission periodic assessment of individual country convergence programmes. 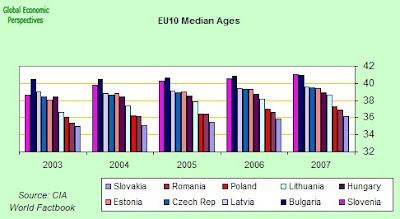 The Czech Republic is by no means the oldest of the EU10 societies, indeed at around 40 the Czech median age is not especially high at this point (even by EU10 standards) - and Slovenia and Bulgaria have higher median ages. 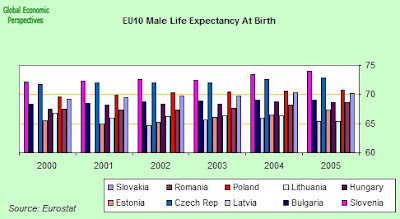 But life expectancy in the Czech Republic is significantly higher than the rest of the group (coming second in this respect only to Slovenia) and hence the weight of pensions expenditure is likely to be greater than in many other states in the region. 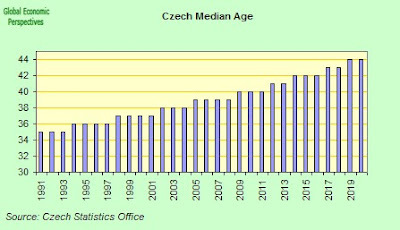 As a result of this higher than average EU10 life expectancy, and many years of lowest-low fertility, the Czech population median age is set to rise very rapidly - to around 44 in 2020 - which means that the Czech Republic will soon be older than several West European societies (where there has been higher fertility and more substantial immigration) like France or the UK. And this despite the fact that the Czech Republic has been one of the few EU10 societies to be really proactive on the immigration front in recent years. The Czech Republic's budget deficit is now within the EU 3 percent of GDP limit, but this is not the Commission's real concern in this report. Rather what are being raised are longer term structural and sustainability questions. 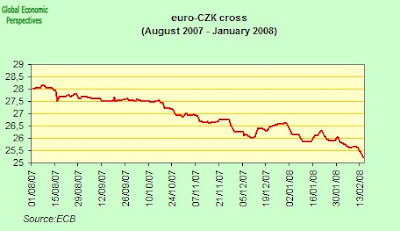 The Czech government should "exploit the likely better-than- expected 2007 budgetary outcome to bring the 2008 deficit below the 3 percent of GDP reference value by a larger margin" the EU said in the report since "The Czech Republic remains at high risk with respect to the sustainability of public finances". The Czech Republic appears to be at high risk with regard to the sustainability of public finances. The initial budgetary position in the programme is not sufficiently high to stabilize the debt ratio over the long-term. The long-term budgetary impact of ageing is well above the EU average, influenced notably by a substantial increase in pension expenditure as a share of GDP as well as a significant increase in health care expenditure. Implementation of structural reform measures notably in the field of pensions and health care aimed at containing the significant increase in age-related expenditures would contribute to reducing risks to the sustainability of public finances. While initial steps have been made to reform the health care system, reform of the pension system still lacks implementation against a definite timetable. To date the Czech Cabinet has pledged to trim the public deficit to 2.6 percent of GDP in 2009 and to 2.3 percent in 2010, but given the rate of GDP increase, and the rapid rise in the koruna, a strong move in the direction of a budget surplus would seem to be called for. The Czech administration, which in 2006 abandoned 2010 as the country's euro-adoption date, has pledged to overhaul the welfare, pension and health-care systems in an attempt to ensure that country is in a position to fulfill the EU fiscal rules after it accepts the common currency. One of the problems being faced is that the ruling coalition lacks a sound majority in the Czech Parliament, and has to rely on two former opposition deputies, which makes progress on serious reform an uphill struggle. But if it remains substantially unamended, the current pensions system will weigh heavily on state finance during the coming years due to the rapidly increasing number of retired people and the shrinking number of potential contributors. The working age population - 15 to 64 - is set to shrink from around 7.25 million now to around 6.4 million in 2025. While the elderly dependent population - defined as being over 65 - is set to rise from around 1.5 million currently, to around 2.25 million in 2025. Now the numbers involved here are not excessively large, and the situation can to some extent be eased by immigration, raising participation rates, and raising the retiremnt age beyond 65. But it is important to note that all the countries in the region are facing - to a greater or a lesser extent - the same problem, so it isn't clear where the migrants are to come from, and if they ultimately will arrive from another continent, then this has implications for the cultural model on which these societies have been based to date. Which is not to say that such an outcome is unattainable, but simply that it is not going to be as easy in practice as it perhaps appears to be on paper. On the pensions side the current problems are threefold: i) the excessive reliance on a PAYGO system, ii) the high level of contrubutions, iii) the low level of the retirement ages. Pension contributions currently total around 30% of employee earnings, of which 7.5 percentage points are paid by employees and 22.5 points by employers. These contribution levels are among the highest in the OECD, and only Hungary, Italy and Slovakia have higher contribution rates. Following an earlier reform, the retirement age is gradually being increased from 60 to 63 years for men and from a range between 53-57 years to one between 59-63 for women (with the retirement age depending on the number of children they have had) between now and 2013. But such age increases are clearly far from sufficient. As a result the Czech cabinet agreed last Monday to raise the retirement age and lay the basis for wider pension reforms to secure the system's long-term financial stability. The cabinet sent a bill to parliament which envisages a gradual increase in the retirement age to 65 by 2030 and an extension of the required length of employment. A further proposed step will follow later which involves moving from the current pay-as-you-go scheme to a partially fund-based system where people save for their own pensions. Czech pension payments are expected to reach 306 billion crowns ($17.34 billion) this year, taking up nearly 30 percent of the national budget, and will grow rapidly as the population ages if nothing is done. Basically the big problem with moving from PAYGO to partially funded schemes is maintaining the payments from the PAYGO system during the transition. As a way of trying to get round this problem the government proposes to set up a fund fed by income from privatisations, with the idea being that the shortfall caused in the old system by the payment diversion into would be made up from the reserve fund. Many Czechs already have private pensions savings, which are supported by government subsidies and tax breaks, but the volume is too low to support them in retirement. 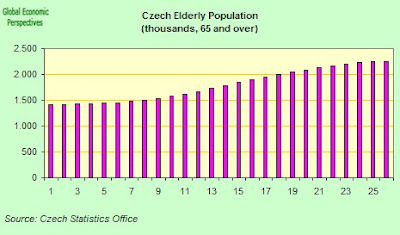 The average Czech state pension is 9,111 crowns ($515.9) per month, about 42 percent of the average salary. Bad Timing or Bad Decisions? So much for the longer term issues, but the real danger facing the Czech economy at the present time is that a number of faulty short-term decisions, and a certain tardiness in reform coupled with an unhelpful external environment, may well cost the Czech Republic dear in the longer term. In the first place the recent decision to raise administered prices in January has produced a sharp 2% hike in the annual inflation rate (from 5.4% in December to 7.5%in January). In particular the government raised value-added tax on basic items such as food to 9 percent (up from 5 percent), and introduced a 30 koruna ($1.71) fee for doctor's visits. In total the health service increases added 0.5% to the annual inflation rate. The price of electricity also went up 9.5 percent and natural gas 7.8 percent. State-controlled rents jumped 18.9 percent from their December level. 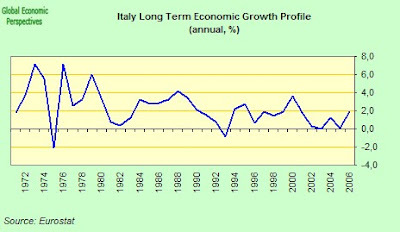 So the danger is that the application of such measures in an environment where growth is strong, and possibly even above capacity, and the labour market is extremely tight, may simply lead to an ongoing process of second round effects, where wage rises to compenate for inflation (or over and above the inflation rate) simply add more fuel to the underlying inflation dynamic. In order to try and avoid this outcome the central bank will undoubtedly continue raising interest rates. The bank has already raise rates five times since last June - at quarter point intervals (with the last raise being on the 8 February - and the current rate is at 3.75%. The prospect of the bank doing just this, coupled with the comparatively high rate of GDP growth, is already pushing - as we have seen above - the koruna ever onward and upward. 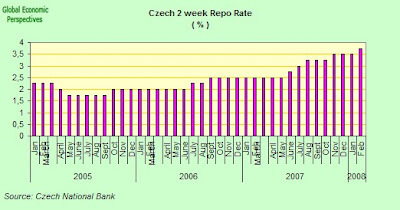 If, as now seems likely, the Czech base interest rate should pass an ECB refi rate which was on the way down as the eurozone economy slows, then this upward pressure on the koruna might well accelerate, and the central banks attempts to restrain inflation with conventional monetary policy might well prove thwarted. Added to this problem of inflation and a rising koruna, is the associated one of the evolution of the Czech trade balance. While the Czech Republic has so far enjoyed a fairly healthy goods trade surplus, this does not come by divine fiat, and changes in relative prices can erode the situation quite rapidly. Exports in December were up 5.2 percent year on year down down substantially from the 20 percent rate in November and the smallest figure in the whole of 2007. 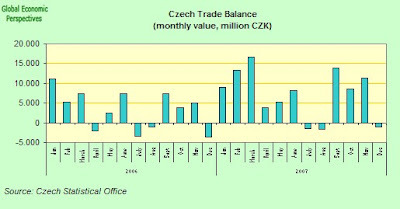 For the time being this is simply a seasonal blip, but the whole Czech external trade situation will now need monitoring carefully, and in particular given that the German economy now seems to be slowing, and the Czech economy is inter-locked with Germany (31% of the CRs exports went to Germany in 2007) to a very high degree. Hungary's forint firmed slightly today after standing up to several waves of pressure, settling around what still amounts to a one-week low against the euro. The mildly favourable retail sales data that came out in the US during the afternoon eased some of the pressures on emerging market economies and in the collective upswing the forint managed to get back below the 262 to the euro level. Just enough to knock out stop-loss levels, but hardly anything to get excited about. The forint had been as far down as 266 to the euro earlier last week - amid a spate of rumours which included the idea that the prime minister was about to resign, and that the central bank was about to announce an emergency rate cut (or was that increase, I never was sure which possibility was most in people's minds at that point). Indeed it was clear that a general downturn in global risk appetite which struck all across emerging market instruments was hitting Hungary's long-unsteady markets the hardest. Hungary's economy has slumped to decade-low in growth following a government belt-tightening campaign aimed at straightening out its public finances. Portfolio Hungary reports this morning on the view of Danske Bank analyst Lars Christensen. Christensen's argument is that it is only a matter of time before the forint follows the leu, the kronur and the rand in weakening significantly. 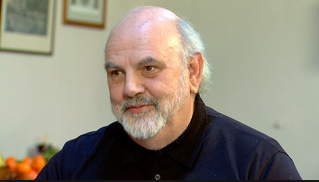 In particular he argued that the forint is not sufficiently protected by adequately high interest rates. “Most notable has been the weakening of the Romanian leu, Icelandic kronur and the South African rand, which have all weakened around 15% since the beginning of August. The lira has more or less been flat against the euro since early August and the forint has “only" weakened around 5%". “While we clearly see a risk that these currencies can weaken significantly more, there is also a risk that this weakening will spread to other EMEA economies with similar problems. In particular, the Turkish lira and the Hungarian forint stand out,"
“While high interest rates in Turkey give some protection, it is hard to use the same argument for the forint and hence we believe that it is only a matter of time before the forint follows the leu, the kronur and the rand and weakens significantly." As he points out, imbalances have been reduced in the Hungarian economy on the back of last year's tightening of fiscal policy, but the markets have also 'rewarded' the Hungarian government for this by not selling the forint as much as the continued large imbalances and large foreign debt could 'dictate'. Also, as the global credit crisis drags on there is an “increasing risk that we will have a repeat of the forint 'crisis' of 2006", where the HUF fell sharply from around 250 against the euro to 285 in a comparatively short space of time. And the global financial environment at that time was significantly more benign than is the case at the moment. So a forint at 280 or below to the euro hardly seems an unlikely level at this point in time, and indeed Lucy Bethell from RBS was arguing exactly this earlier in the week. In particular, Christiansen stressed that any “slippage" on fiscal policy in Hungary would hit investor confidence hard and this would also “likely lead to downgrades of Hungary's credit ratings". 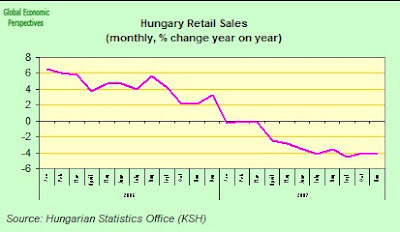 And this is just why tomorrows Q4 2007 preliminary GDP data will be so important, since if the figure slips to any great extent on the downside this is bound to place strong question marks around Hungary's 2008 budget targets which are - let us remember - based on government estimates of GDP growth in the 2.8 to 3% range. There are good theoretical reasons - at least if you take demography seriously there are - for imagining that the Turkish economy might well prove to be more robust than some of the Eastern European ones will under the strains the various economies are under and about to receive. These latter economies, despite their apparent vibrance are actually much more fragile under the surface, and it is for this very reason that the observed response differences bear examination day by day. I Suppose That's The Hill Sergeant, and I Guess You Are Going To Make Me Climb It. The most probable scenario we now face is for the forint to experience a succession of waves of attack, and a systematic attempt to knock it of the perch on which it is so delicately poised. All free-market economists of course believe in the workings of financial markets as a regulatory mechanism, but we don't have to believe they are fair, kind or forgiving. There seem to be three critical tests facing the forint in the short term. The first is the GDP and inflation data coming tomorrow. 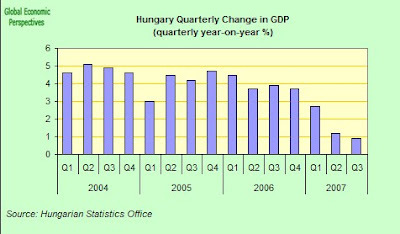 Starting with the Q4 2007 GDP data, my opinion is that this will surprise on the downside, and possibly give every indication of just how unrealistic most of the 2008 GDP forecasts for Hungary currently are. The second is the inflation data, and here the Hungarian central bank is now almost certainly in a heads I lose, tails I lose situation. 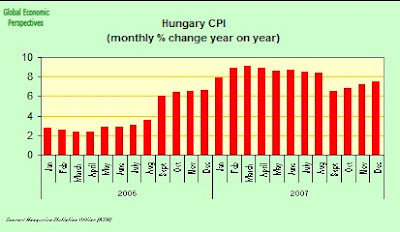 If the CPI - Hungarian inflation was running at an annual rate of 7.4% in December - surprises on the downside this may encourage currency dealers to feel that the central bank will bow to political pressures and reduce interest rates - a move which the collapse in Hungarian internal demand suggests is badly needed. But the reduction in yield differential would make forint denominated assets less attractive, suggesting that the foring would face a more testing toime and that an acceleration in capital exit would probably occur. If, on the other hand, the data surprises on the upside - which after today's December agricultural PPI data (38.1% y-o-y) seems more likely, then this may lead people to feel that the central bank will have no alternative but to increase rates. Indeed many market analysts have now reached the conclusion that such rate rises are more or less inevtiable. The latest of these has been Gillian Edgeworth of Deutsche Bank, who today projected a total of 100-bp rate hikes in the next six months (over the course of the next six policy meetings. ), and in this she has joined a fine galaxy of observers including Goldman Sachs and Citigroup - who are projecting a 50-bp hike at the 25 February policy meeting, while Citibank analyst Eszter Gárgyán is on record as saying she does not believe that even a 50-bp hike could be enough to stop the weakening of the forint. 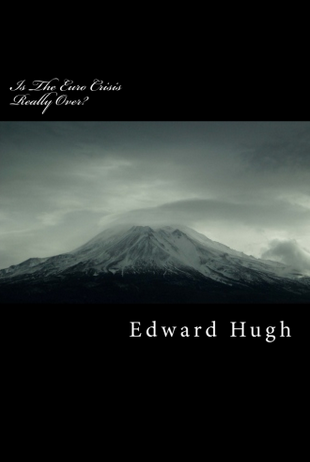 I am not sure how much of the macro-economics of what is involved in all this these forecasters understand, but I am quite happy to say that the sort of monetary tightening that Gillian Edgeworth is contemplating is just not posible at this point in the game, since, apart from the fact that it would send Hungary off into one whopping and unholy recession (especially if it was accompanied - as it would have to be - by a continuing tightening of the loan conditions on Swiss Franc mortgages, due to the hightened currency risk default issues), the political dynamics would not accept it. You can only ask people to accept so much belt tightening before they rebel, and we are already over 18 months into this round, so tolerance must be wearing thin, and another year of monetary tightening is most definitely out at this point. If you have any doubt whatsoever on this, look at what has happened in other countries in other epochs. So, given that not all market analysts are competely devoid of foresight, any move to press the tightening trigger can alos lead to a similar conclusion to a rate cut about the desireability ditching Hungarian assets, since more monetary tightening would only close even further the noose which is currently extending its grip over the internal economy. Such are the difficulties when you back yourself so tightly into a monetary and fiscal corner. The second hurdle, or critical point, the forint will have to get over - assuming it survives tomorrow - will them be the meeting of the central bank itself on the 25 February, and again rate policy decisions either way can have unpredictable effects, and once more it is likely that an attack will be mounted, regardless of the decision taken, given (as I argue above) there are sufficient reasons for doubting that either policy option is a good one. What all this amounts to is that the Hungarian central bank has now run out of policy options, and it is just a question of time before we get to see what the financial market participants decide to do about the situation. Finally, and assuming that the currency passes muster relatively unscathed in the first two initial skirmishes, the cherry is most decidedly and firmly likely to be planted on the top of the cake if the proposed referendum on some of the more controversial measures in Hungary's adjustment programme actually gets to be held on March 9th. Since a vote to abandon the contested education and health service charges - which seems on the face of it to be the most probable outcome - would virtually present a frontal challenge to the whole "adjustment" process, it is hard to see how the Gyurcsany government could continue under the circumstances (even if there would be no formal obligation to resign). This kind of situation is, of course, "more power to my elbow material" for those market participants with an acquired taste for warm, freshly-spilled blood, and really if we got through to this point, without anyone having the presence of mind to take the bull by the horns first (by which I mean making a virtue out of a necessity, and openly accepting that policy is now in a no-exit bind, and that a significant drop in the value of the forint is both inevitable and desireable, depite the fact that there will be a lot of renegotiating and cleaning up to do in the aftermath), then the outcome may well not be a pleasant sight to watch. 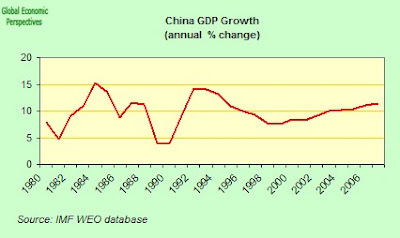 Has China's Economic Growth Passed It's Peak? Is the annual rate of Chinese growth now about to slow, not just temporarily, but may it actually be that the long march of Chinese "catch-up" growth is now finally slowing? This is the question that was asked by the Financial Times earlier this week, and, as they point out, it may well be that behind those headline forecasts for decelerating Chinese output in 2008 there lies a deeper and more significant trend that may mark the arrival of the long-awaited turning point in the trajectory of the Chinese economy. Certainly both local Chinese and World Bank economists have significantly downgraded their forecasts for China’s 2008 growth in recent weeks – down from 11.4 per cent rate achieved in 2007 to around 9 to 9.5% this year. But more importantly, could the 11.4 per cent expansion in 2007 – the fifth consecutive year of double-digit increase – represent the peak point in headline growth for China's economic development process. That is, after falling back this year, will Chinese growth ever climb back to its previous heights, and even if it doesn't , should this fact be producing concern among us? On the face of it, it is obvious that noone - not even China - can continue growing at double digit rates forever, and at some stage the cycle of growth will fall steadily back towards the much lower rates traditionally associated with a developed economy. The big question is really, has that point now been reached? To get an idea of what we are talking about, and of what all this might this mean, perhaps it is interesting to take a quick look at the longer term growth patterns of some other economies who have been through the "accelerated greenhouse" catch-up growth that China is currently enjoying. Perhaps a good place to start would be with South Korea, since South Korea is arguably the South East Asian "tiger" which is most similar to what Chinese economic evolution might look like, since Singapore, Taiwan and Hink Kong are, each in their own way, very special cases. 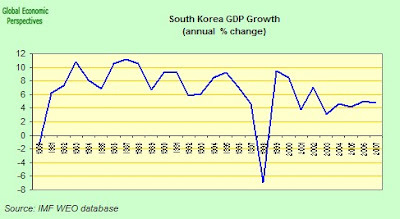 Now as we can see from the above chart, South Korean was at one point very strong indeed, until growth "peaked" around 1987 (at 11.1%) and since that time growth has followed a more normal cyclical pattern, with the important detail that with each successive cycle Korean growth has slowly and inexorably slowed ("stripping out" the very exceptional sharp decline and rebound produced by the Asian crisis in 1998). Economic growth for an emerging economy tends to show this kind of profile since in general terms there are both technological and demographic components in "catch up" economic growth - although there may actually be no such thing in reality as a constant steady state rate to catch up with as I try to argue here - and once most of the technological gap has been closed and the benefical momentum of arriving at maximum proportions of the population in the highly productive 25 to 50 age group begins to pass, economies then seem to eshibit a steady loss of momentum rather like air escaping from a pinprick in a gas balloon, as we can see in the cases of the two oldest societies on the planet, Japan and Italy, in the charts below. Now I have singled out Italy and Japan (the profile for France, or the UK, or the US is really quite different) since they are both late economic developers, and also since their subsequent demographic transition to ultra low fertility has been very rapid, as it is about to be South Korea and China. Hence Japan and Italy have experienced very rapid ageing, and we already know China is about to follow them down this road, at what may well be an even more rapid pace. In fact China may well, thanks to the presence of a forced restriction of fertility, a reasonably high level of life expectancy and a virtually negligible impact from inward migration as we move forward, become the most rapidly ageing society the world has so far seen. The comparative median age charts for China and South Korea give the general picture. 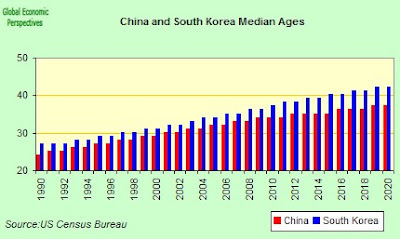 When we get to 2020 China will still be significantly younger than South Korea, but is following the same trajectory. By 2020 Korea will be nearly as old as the three oldest societies - Germany, Japan and Italy - currently are, and will in all probability be older than slower ageing societies like the UK and France. The is a very dramatic change for a newly developed country. So what do we know about growth to date in China? Well, lets look at the longer term chart. Now when we come to look at this chart, we immediately face a number of important problems. The first and most obvious one is that the further back in time you go prior to 2000 the more unreliable the data is. So the fact that the maximum growth period seems to be in the mid 1980s, followed closely by the mid-1990s burst might, at first sight, seem strange, since it is the growth spurt which China has enjoyed post-1998 which has really been the most convincing. But it should be noted that China's demographic trajectory is virtually unique, and it is the case that it was getting some sort of potential demographic dividend or other well before 2000, so while the earlier data most probably does not give a complete picture, perhaps it would be a mistake to disregard it altogether. Of course, the more credence we give to the 1980s growth, the more we have to reach the conclusion that some significant slowing down or other may well be at hand, since following the trajectory of the line would suggest it. But as I say, maybe we shouldn't give too much credence to earlier data, so we need to be carfeul with this kind of argument. What we do know is that from the late 1990s onwards China systematically introduced a very extensive labour and financial market reform process, and this certainly has served to unlease a huge amount of pent-up potential, and it is this which has given us the sustained growth since the early 1990s which has only been accompanied by one small dip between 1998 and 1999 (again the Asian crisis). 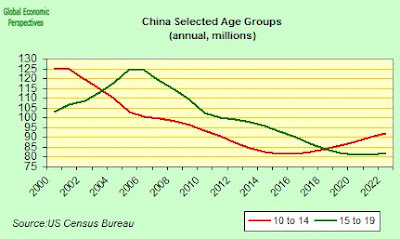 Now if we think about the currently rather fashionable coupling-decoupling arguments in this context, it is clear that China was effectively "decoupled" during the 2001 internet bust global slowdown, since it kept growing regardless. That is to say there is evidence that China was much more affected by events in surrounding Asia in 1998 than it was by the recession in the G7 in 2001/2002. There are of course plenty of reasons for taking the view that things may not be the same this time round. China is evidently much more "locked-in" to global dynamics due to its systematically increased share in world trade. Also China was much more able during to trade increasing its market share for slowing overall world growth during the last recession, by using its price leverage - due to all that pent-up unused labour - but again there are reasons (and especially the domestic inflation ones) for thinking that things may not be quite the same this time. This would be doubly the case if China has been able to extend the post 1998 wave beyond its natural duration by taking advantages of the global imbalances situation, and its own currency and price leverage, to extend its export growth beyond what might be considered the normal sustainable extent. Basically I am very suspicious when I see such extended growth with virtually no humps, like we get in the Chinese case. As we can see for the other charts, growth should be more wave like, so we should at least ask ourselves what it is that has been going on? So the big question is when will the current wave come to an end, and when could we expect China to follow in the footsteps of South Korea and show us that steady but constant reduction in annual growth rates. Well... looking at the chart, and sticking my neck out, and also making some sort of back of the envelope estimation about how intractable the inflation problem may turn out to be (and of course recent Eastern European and Russian experience is relevant in this context), my feeling is we may well find China starting to slow this year, and the process continuing next year, and the one after etc - with the normal and anticipated ups and downs. So the Financial Times may well be right when it suggested that Chinese growth may slow and never quite be the same again, but there are grounds for thinking that they may perhaps have only captured part of the picture, and the grounds for thinking this are that they do not appear to have factored in population, labour market and inflation dynamics, and the ineveitable interaction of the three of them. Certainly Chinese growth from now on is going to be constantly pushing up against limits which are increasingly set by the level of inflation. The inflation problem China has is a very real one, and at this point in time it is hard to see how they can adequately address it. Certainly the popular remedy - unchaining the yuan - could just as easily lead to an acceleration of capital inflows and a further increase in the overheating problem as to any more benign outcome, and I here I would suggest we treat New Zealand (and India for that matter) as the "Canaries in the Coalmine" (or if you prefer "smoking guns"). Conventional monetary policy is up against very clear limits at the present juncture. And the recent resort to administrative measures seems almost destined to fail - as it is failing in the Russian case - since the problem is not a temporary one produced by high oil and food prices (which are anyway in part a by-product of Chinese growth), but is now becoming more endemic and structural. In the face of the present inflation surge the Chinese government has been gradually widening price controls, and finally took the plunge and froze all food prices last month while at the same time clamping limits on fertilizer prices and raising price supports for rice and wheat. These controls are meant to shield China's poor and working classes, who spend up to half their incomes on food. 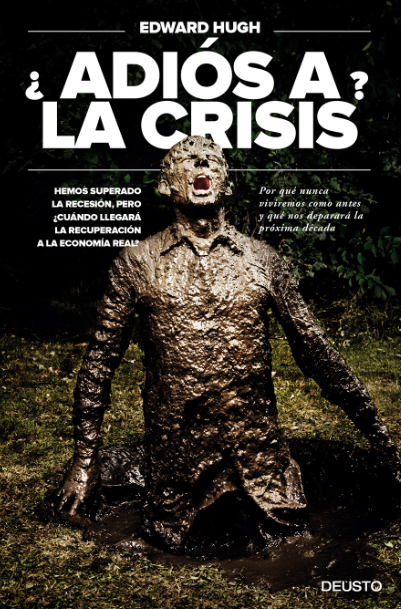 But the inflation spike is blamed on shortages of pork and grain, and it is obvious that putting a lid on prices simply shifts the hardship over to the farmers, discouraging them from raising output, and thus in the medium term reducing output and putting even more upward pressure on prices. The recent extreme weather has only exacerbated the problem. In order to ease electricity shortages, thousands of trainloads of coal were rushed to power stations and hundreds of mines were kept running through the Lunar New Year holiday. But with the price of coal now forecast to climb by anything up to 100 percent this year, Beijing has yet to say how power companies will cope. So I am really not that clear that China has any easy way out of the present inflation dynamic - and remember this is a huge change from the moment when China was reportedly "exporting deflation to the rest of the world", a process which at best has lasted from 1998 to 2007, but is unlikely to continue in the same way. In addition there is now significant evidence of labour market tightening in some parts of the Chinese economy. Wages and salaries of employees went up in the 3rd quarter of 2007 - the latest quarter for which we have data - by 22% (and by 27.2% if we take the private sector alone). And there are significant regional differences, with wages in the private sector in Beijing rising by 36.4% year on year. Even subtracting inflation these are sill very high rates of increase in real wages, and are surely not compensated for in their entirety by productivity increases. So China is steadily losing its competitive edge. Clearly given the very low level from which Chinese wages started, and the restrained growth in the value of the yuan, it is possible to absorb to some extent such increases. The problem is that they may go on and on, and even accelerate. The reason I say that we should expect worse to come in this regard is due to the underlying strong structural break in the Chinese population pyramid, a break which has been produced by many years of one child per family policy. Looking at those other canaries we have sent down the collective coalmine - Latvia and Estonia (and then, of course, Russia), then it does seem that push-comes-to-shove much sooner than any of us had been anticipating in the question of labour market tightening in the key 15 to 24 age group. In a way these could be thought of as the labour market equivalent of "first time buyers" in the housing market, since they tend to set the rates for others higher up the ladder. And just in case you have difficulty imagining how a country with a 750 million odd labour force could possibly have labour shortages, just remember that this labour force has been growing at an annual rate of 6 or 7 million to sustain the double digit growth rate, and even China can't find the additional people to keep explanding its labour force at this rate forever. And in particular it can't with generational cohorts which will soon be much smaller than those exiting the labour force at the upper age end, and with participation rates in the 15 to 24 age group bound to fall as people go for more and higher levels of education. Maybe it is worth bearing in mind here, that size doesn't mean you have less labour supply problems, au contraire you have more as time passes, and it is no accident in this regard that Russia and the US are the two countries with the largest annual migration needs. In theory we might expect the Chinese economy when it finally becomes the largest in the planet to also be the world's largest consumer of economic migrants, but this scenario hardly seems plausible. 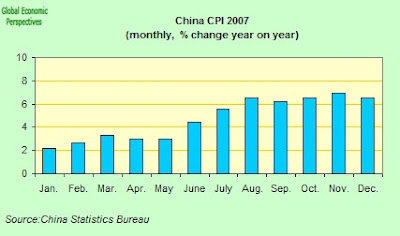 As I say, 2008 could well be the year that inflation really gets a hold on China. 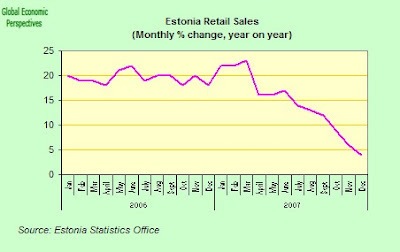 Certainly the strong uptick in the latter months of 2007 is evident, as can be seen in the chart below.